It’s the story of Shani Gofman (that’s her in the photo below) who at 17 years of age was 5’1″ and 250lbs and whose pediatrician, that’s right, pediatrician, first started suggesting to her that weight loss surgery might be the answer. Those are encouraging words from your doctor, who most look to as being responsible for their health. Hmm… I wonder if she is going to succeed. But, wait, it gets better. Really? That’s been the “medical establishment’s” advice? That’s the best a doctor can do? Go home, diet and play, and if that doesn’t work, come on back and we’ll put a belt around your stomach. Why are we going to doctors to solve nutrition, exercise and lifestyle/behavior related problems? Doctors prescribe drugs and procedures. To become an MD you have to take one class in nutrition and I suspect 0 classes in personal training. 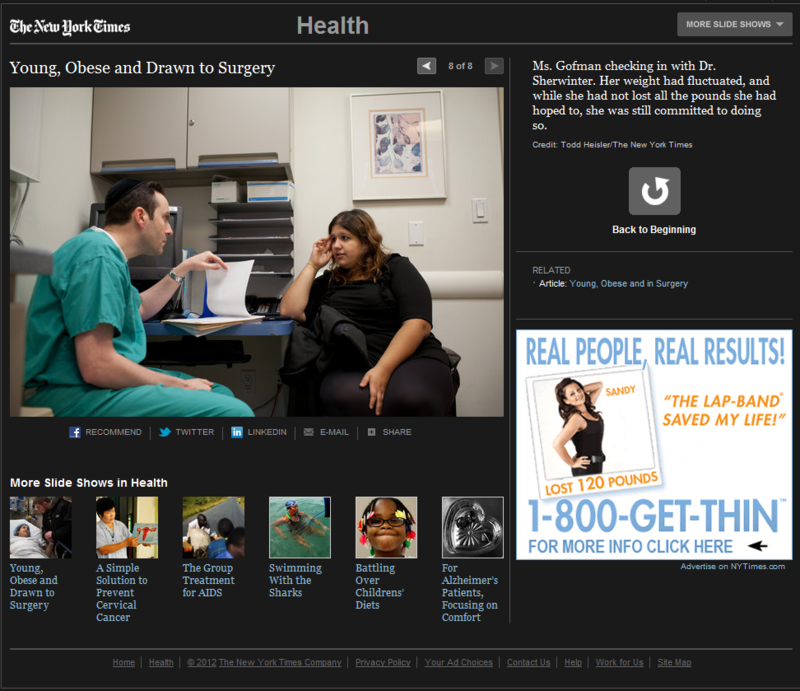 The Lap-Band procedure takes 25 minutes, the NYT followed Shani on her journey for a year, and guess what, she kept eating. In Shani’s own words “I’m not good at moderation”. After a year, it seems she has lost about 35 pounds (from 270 at the time of the surgery) and gained about half of that back, so she’s in the 250 range now. But wait, it gets better. Alergan, the company that makes this Lap-Band product (the belt they surgically strap around your stomach) is pushing very hard to get the FDA to allow it to be used on 14 year old kids. Weight-loss surgery is a $6 billion a year industry. It’s big business, they want to expand the market to kids. It wouldn’t surprise me if they partner with McDonalds: Get a toy Lap-Band in your Happy Meal!! Learning to eat healthy and exercise is definitely not good for the healthcare business. And… here’s the kicker. I applaud the New York Times for writing this article to help highlight just how screwed up our society is when it comes to health – but have a look again at the photo above, the bottom right corner – that’s a context sensitive add, taking up maybe 15% of the pixels in that screen shot. Yup, that’s an Alergan add for Lap-Band. This entry was posted in Healthcare, Lifestyle. Bookmark the permalink.